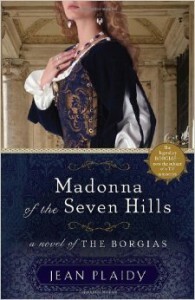 The most beautiful woman in Rome, Lucrezia Borgia, was born into a family—and a destiny—she could not hope to escape . . .
Fifteenth-century Rome: The Borgia family is on the rise. Lucrezia’s father, Pope Alexander VI, places his illegitimate daughter and her only brothers, Cesare, Giovanni, and Goffredo, in the jeweled splendor—and scandal—of his court. From the Pope’s affairs with adolescent girls to Cesare’s dangerous jealousy of anyone who inspires Lucrezia’s affections to the ominous birth of a child conceived in secret, no Borgia can elude infamy. Young Lucrezia gradually accepts her fate as she comes to terms with the delicate nature of her relationships with her father and brothers. The unbreakable bond she shares with them both exhilarates and terrifies her as her innocence begins to fade. Soon she will understand that her family’s love pales next to their quest for power and that she herself is the greatest tool in their political arsenal. with passion, intrigue, and murder—and it’s only the beginning. I hope that my readers will bear in mind the proverb Altri tempi, altri costumi, and adjust their mental vision to the fifteenth century when Popes took their vow of celibacy merely as a form, and when murder was so commonplace that an old Tiber boatman on seeing the body of the Pope’s son thrown into the river did not think it necessary to report it because he saw bodies thrown in every night. Only by judging the Borgias against their own times can they arouse our sympathy, and only if they arouse our sympathy can they be understood. Lucrezia Borgia: A Chapter from the Morals of the Italian Renaissance. Ferdinand Gregorovius. The Life of Cesare Borgia. Raphael Sabatini. Lucrezia Borgia, The Chronicle of Tebaldeo Tebaldei, Renaissance Period, Commentary and Notes by Randolph Hughes. Algernon Charles Swinburne. Life and Times of Roderigo Borgia, Pope Alexander VI. The Most Rev. Arnold H. Mathew, D.D. Chronicles of the House of Borgia. Frederick Baron Corvo. Hadrian the Seventh. Frederick Rolfe (Frederick Baron Corvo). Alma Roma. Albert G. MacKennon, M.A. An Outline of Italian Civilization. Decio Pettoello. Memoirs of the Dukes of Urbino: Illustrating the Arms, Arts and Literature of Italy from 1440 to 1630. (3 Vols.) James Dennistoun of Dennistoun.